May | 2014 | We Can't Hear the Mime! Five years ago Gillian Robespierre made the short film of Obvious Child and had such success that she spent the following five years expanding it into a feature. It’s always suspicious when a successful short is adapted since it requires a very different narrative style and skill to make a short versus a feature, however Robespierre doesn’t seem to have had a problem with this transition. The characters are fully fleshed out, the plot is simple but not slow. In fact, watching Obvious Child now it seems impossible to imagine what could be left out of this coherent whole to make it a short. Obvious Child has a pretty simple premise. 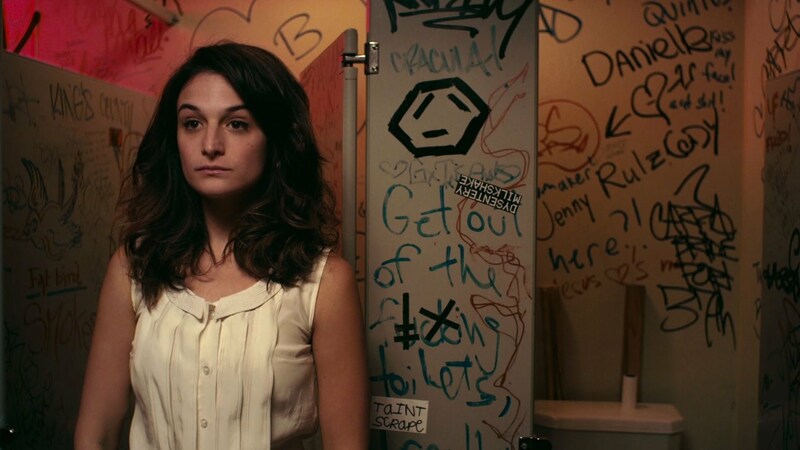 Just before Valentine’s day in the life of Donna Stern (Jenny Slate) she’s dumped, fired and gets pregnant. The film progresses as a story of hope despite circumstances where Donna needs to tackle a burgeoning romance at the same time as her upcoming abortion. It’s refreshing to see a story that deals with an abortion as a normal, healthy part of a woman’s life. However, the very idea seems to throw the film into an arena of debate that it doesn’t deserve. At its heart Obvious Child is a sweet yet cutting romcom. It shows a very normal person living a normal life. Unfortunately, the inclusion of an abortion, which is a common point for many women turns the film into a dramatic discussion. Really, I feel that this film is best enjoyed with a tub of ice cream and a glass of wine. It’s not a piece of feminist propaganda or a debate feature. It’s the most simple form of representation, just accepting and showing real life with no holds barred, and even making it into a comedy. The comedy in the film is mainly provided by Jenny Slate; a stand up comedian playing a stand up comedian. Oddly her comedy routines are some of the least funny or accomplished parts of her performance. Two of the three routines are meant to be painfully awkward and we laugh at her in these moments because she’s doing an excellent job of portraying the over-sharing comedienne. The third, however seems to centre around scatological and appearance-based humour. Neither of which bring out the more sophisticated side of the performance. It’s a shame, but this seems to be the fault of the script more than the performance since Slate is raucously funny throughout all the little moments in the film. Despite the melodramatic premise Obvious Child doesn’t become irritating or self-absorbed and that is entirely due to Slate’s light-hearted and charming performance. Her comedy succeeds in undercutting the emotional moments without undermining them. That being said, Slate is surrounded by an outstanding supporting cast. Jake Lacy is incredibly natural in his role as the one-night-stand gone wrong and Polly Draper, despite not appearing often, provides one of the best scenes of the film as Donna’s mother. It’s generally a faultless production and a highly enjoyable film, amazing for a first feature and I can’t wait to see what Robespierre produces next. This entry was posted in Film Reviews, Sundance London 2014 and tagged 2014, Gillian Robespierre, Jake Lacy, Jenny Slate, Obvious Child, Polly Draper, Sundance, Sundance London on May 13, 2014 by Flo.